Two days before competing in the United Airlines NYC Half, a group of professional athletes made a visit to P.S. 001 in Chinatown, a Rising New York Road Runners site less than two blocks away from the Manhattan Bridge, where the pros—along with 22,500 more runners—will be racing on Sunday. 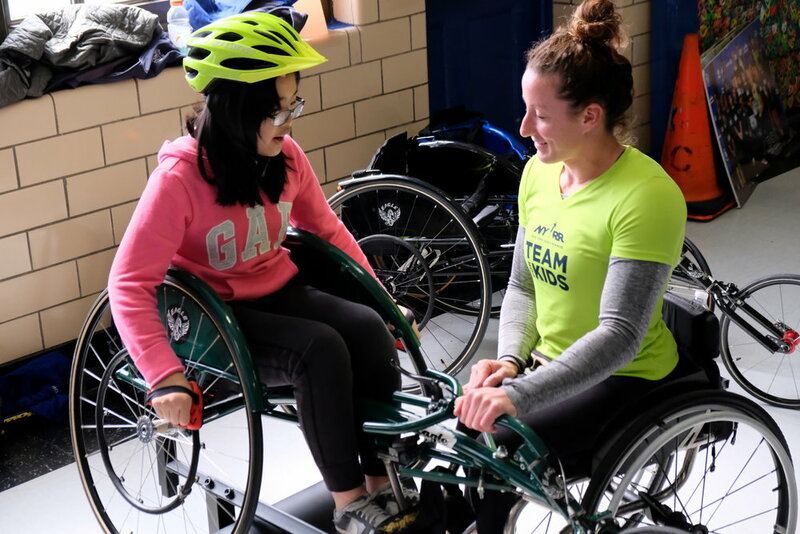 The afternoon of activities allowed students in grades 4 and 5 to interact with and learn from a group of world-class runners and wheelchair athletes. Combined with a shoe distribution for pre-K through grade 3 earlier in the morning, approximately 325 students set off with a new pair of New Balance running shoes at the end of the day, courtesy of NYRR and New Balance's 1 for You 1 for Youth program. 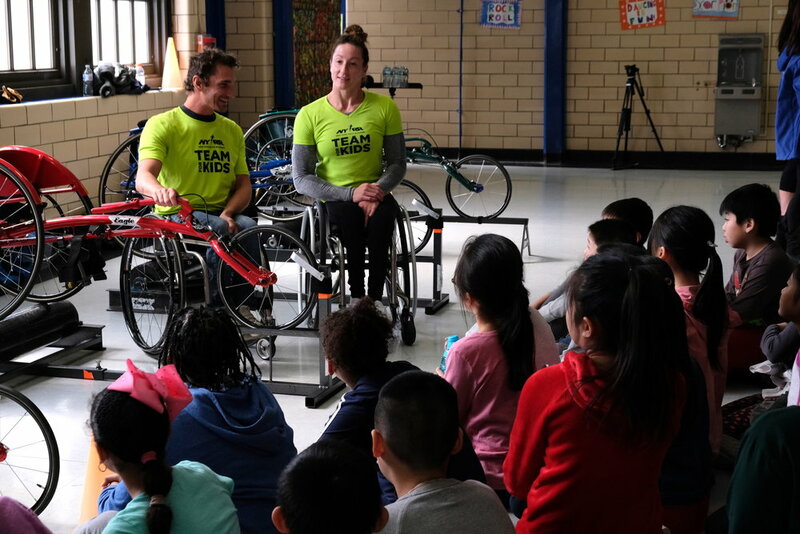 With previous NYC Half champions Josh George and Tatyana McFadden on hand, students had two of the best wheelchair athletes in the world ready to teach them about the sport. After the pros guided groups through the basics—how to steer, how to brake, and how to push—the students took turns trying out the racing chair for themselves. Even Peter Ciaccia, NYRR's President, Events, and Race Director, TCS New York City Marathon got to take the chair for a spin! NYRR Team for Kids Ambassadors Josh George and Tatyana McFadden guide P.S. 001 students through the parts of a racing wheelchair before students took the chairs on a test ride. Tatyana McFadden encourages a student from P.S. 001 as they learn how to maneuver a racing wheelchair. Josh George guides a P.S. 001 student on how to push a racing wheelchair. Peter Ciaccia, NYRR President, Events, and Race Director, TCS New York City Marathon, gets some pointers on wheelchair racing from Josh George and Tatyana McFadden. 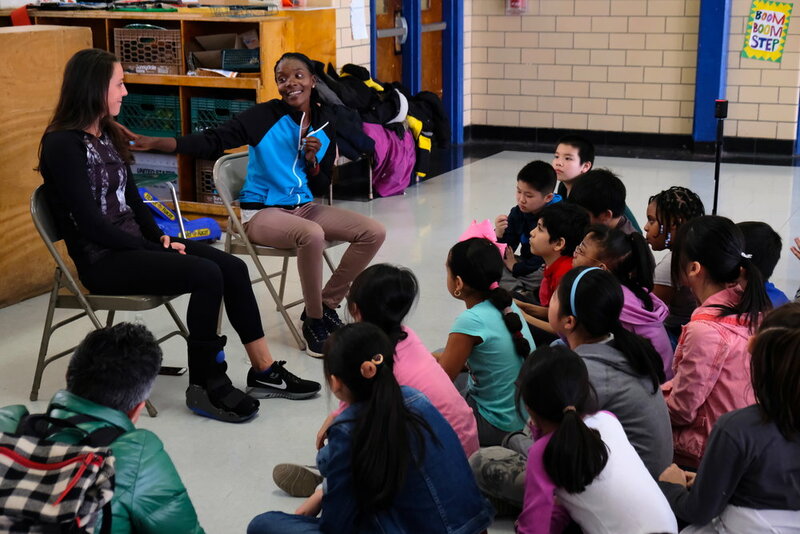 Just a few feet away, Allie Kieffer and Betsy Saina spoke with students about their running history, and how they came to be friends after competing against one another in the 2017 TCS New York City Marathon. Kieffer and Saina share their running history with students from P.S. 001 in Manhattan. Upstairs, in the school's gym, students were outfitted with new pairs of New Balance running shoes, as Team New Balance athletes Emily Sisson—also an NYRR Team for Kids ambassador—and Liz Costello helped hand out shoes and make sure students had the right fit. NYRR Team for Kids Ambassador Emily Sisson helps outfit P.S. 001 students with new pairs of New Balance running shoes. Team New Balance athlete Liz Costello hands out new shoes to fourth and fifth grade students at P.S. 001 in Manhattan. One way to break in new shoes: Test out how high you can jump! "A lot of students in our school don't come from much, so today is huge for our school," said Matt Sutherland, the school's physical education teacher and Rising New York Road Runners site coordinator. He later explained how one fifth-grade student told him the pair of New Balances was only the second pair of new shoes he had ever received. Once they were all laced up, students had the chance to break in their shoes with a few drills and relay races, as they were accompanied by NYRR Team for Kids ambassador Aliphine Tuliamuk, as well as fan favorite Noah Droddy. As Droddy led the kids on the way up and Tuliamuk cheered them on, the two pros swapped positions for the way back down. Noah Droddy runs alongside P.S. 001 students through a step ladder as NYRR Team for Kids Ambassador Aliphine Tuliamuk cheers them on. Tuliamuk then took a turn with students through the obstacle course, as Droddy gave support from the sidelines. After a whirlwind session of talks, clinics, and drills, the students gathered for a photo to show off their new shoes, as their own "custom-designed" New Balance shoes hung up on the wall behind them. Students from P.S. 001 in Manhattan were excited to show off their brand-new pairs of New Balance running shoes. Students also decorated the walls of the school's gym with their own designs for running shoes. As dozens of pairs of shoes decorated the walls, in total approximately 325 students received new running shoes from NYRR and New Balance courtesy of the 1 for You 1 for Youth program. On Sunday, as the pros race up Seventh Avenue through Times Square, more than 1,000 youth will be racing alongside them in the Rising New York Road Runners at the United Airlines NYC Half, a 1500-meter race through the heart of Midtown Manhattan. Watch the race live starting at 7:00 a.m. ET on WABC-TV, Channel 7 and on ESPN3 via Watch ESPN, and you might just catch the world's best racing side-by-side with the next generation of runners!